Amid fear and despair, we’ll have to find ways to talk to each other. I live in Los Angeles — a sprawling, polluted, overpopulated megacity — alongside millions of busy strangers. I like to describe the feel of the place as apocalyptic. But the truth is Los Angeles has a way of functioning despite the odds. I often think about this when I rush out of my apartment each morning and join the flow of cars on the freeway: I can always count on city workers picking up the trash and fixing roads, around the clock. Families, including mine, seem to manage their busy schedules and still spend time together. We endure long hours inside our cars, stuck in traffic, yet we rationalize this mindless activity day in and day out. Los Angeles is also one of the most diverse cities in America, a hotbed of cultural cross-pollination — the kind of place where we refused to believe that Donald Trump was real. 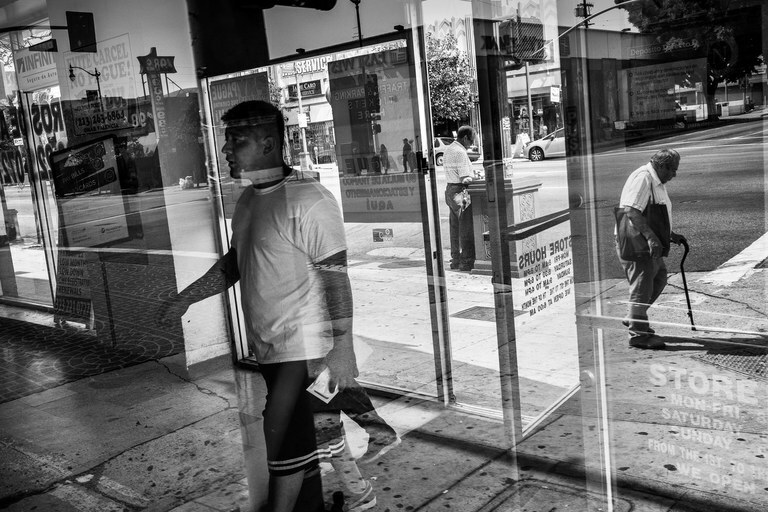 Pedestrians, and signs in Spanish and English, are reflected in a Lincoln Heights storefront window. Although Latinos are the majority here and the Spanish language predominantes, Cantonese, Vietnamese and English can also be heard along Broadway Avenue. My neighbors are a couple of middle-class Asian and Latino families, an African-American couple, retirees. When we run into each other, we say hello, that’s about it. But in the past few months, as this election’s rhetoric heated up and our mailboxes filled up with angry campaign mailers, I felt an urge to get to know them. As a middle class, college-educated, immigrant woman living in the urban West, I’d wonder if they were in my camp, the kind of Angelenos I’ve come to expect in this huge global city: politically liberal, tolerant, willing to embrace multiculturalism. Then, one day this fall, I noticed a Trump sign in the window of an apartment a couple of blocks away, along with more than a few “Make America Great Again!” bumper stickers on cars parked in the neighborhood. Still, I refused to accept the possibility of a Trump win. I was confident that the rest of the West — and a majority of voters — shared my logic, that we’d elect the most decent candidate, someone who did not espouse the racist myth that America’s greatness is in its past. Call me naive. Now we’re all living in a Trump America. Today, there’s a palpable sense of despair coursing through the city, especially among immigrants, people of color, Muslims, Sikhs, Jews. For me, there’s more than despair. There is real fear. Three days after the election, I boarded a flight from Denver to Los Angeles. From the back of the plane, I watched a Salvadoran family — mom, dad and three young daughters under the age of 10 — as they tried to find seats that would allow them to stick together. The mom spoke to her oldest daughter in Spanish, telling her to make her way to her seat, alone. Then, in English, she asked fellow passengers if they wouldn’t mind switching, so that she could be with her other kids. Three days is all it took to embolden bigots everywhere, I thought. Before the election, I would have felt the impulse to shame these men in public. This time, I opted for quiet civility, telling myself I’d speak up if it continued. I closed my eyes. I picked up my novel and read. I put on headphones for a while. A couple of hours later, as we began our descent, I met the gaze of the young white male next to me. He wore a white T-shirt and jeans; a dragon tattoo wrapped around his left arm. “Do you live here?” he asked. His name was Chris and he was 24, from a military family in Colorado Springs. We quickly moved on from small talk and got straight to the topic of the election. “I didn’t vote, but my candidate won,” he said, almost in disbelief. Chris couldn’t articulate why he supported Trump, beyond the fact that, at home, everyone else seemed to. He looked like a tough guy, but when he spoke his demeanor was gentle. Like his father and his friends, he was afraid of terrorists and criminals crossing the border, and he believed Trump when he promised he would get rid of all of them.